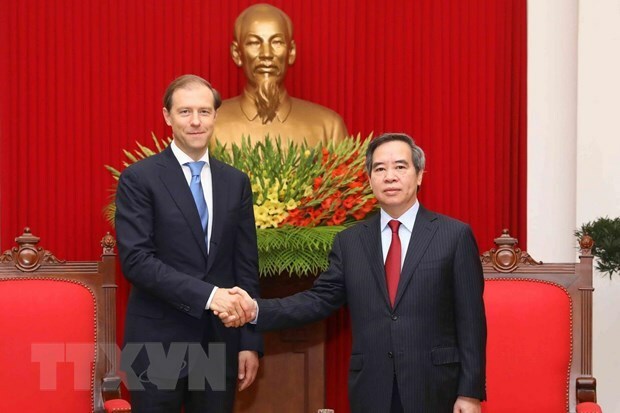 Hanoi (VNA) – Politburo member Nguyen Van Binh, head of the Party Central Committee’s Economic Commission, received Russian Minister of Industry and Trade Denis Manturov in Hanoi on March 27, affirming that there remains much potential for stronger bilateral economic ties. Welcoming his guest’s visit, Binh re-affirmed Vietnam’s consistent stance of attaching importance to the comprehensive strategic partnership with Russia and considering Russia a leading partner in its foreign policy. He said the two countries still have much potential to further develop their economic, trade, and investment connections and bring them on par with the sound political relationship so that bilateral trade will reach the target of 10 billion USD by 2020. The host affirmed that Vietnam will create favourable conditions for Russian firms to do business; take part in key projects in the fields of energy, industry, transport, and agriculture; and expand cooperation in IT and e-government building. He added that Vietnam also welcomes Russian companies’ engagement in developing urban transport infrastructure in the country. The official asked both sides to work together more closely to facilitate economic, trade, and investment links as well as big cooperation projects, while capitalising on the free trade agreement between Vietnam and the Eurasian Economic Union, of which Russia is a member.